When Lee Yee Peng finished secondary school, she was told that only four careers would ensure her a good future — medicine, law, engineering or accountancy. After careful consideration, she decided on law. That was the start of her 15 years in corporate law before switching to property and conveyancing. Then her father passed away in 2015 and that proved to be a turning point. “At 40, I realised that almost half of my life had gone by. I had to do something I had passion for before I lost all the energy to do it,” she says. Taking a leap of faith, Lee bade farewell to her legal career and expanded her side business, selling accessories and stationery under her own label, Emma5. “Back in 2012, I discovered how much I loved making products such as hairbands and pins. From Monday to Friday, I was a lawyer. But on weekends, I was an entrepreneur,” she says. 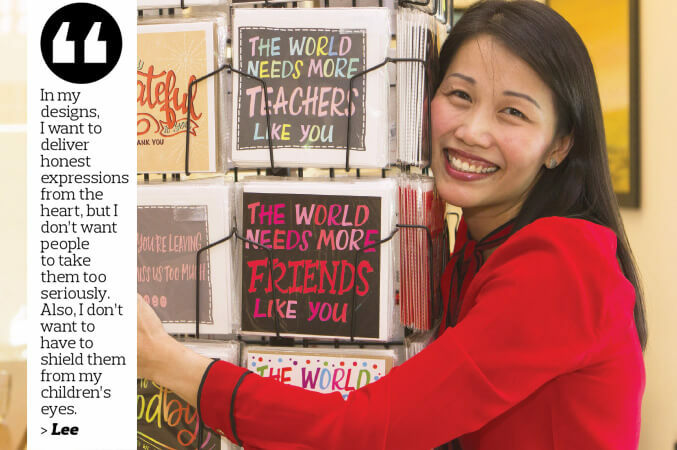 “One day, I started designing and selling my own cards, and the feedback was amazing. On top of that, designing cards was the one thing that made the most business sense for me. There is a limit to how many hairbands and pins I can make a day, but the cards only require me to design them once. Lee started out by selling her cards at weekend bazaars. Last year, she decided to approach retailers to sell her cards on a consignment basis. Today, Emma5 cards are available at 18 stores in Malaysia, including MPH Bookstores, Ben’s Independent Grocer and CzipLee Group of Companies. Although Lee does not make as much as she did when she was a lawyer, she regrets not making the leap sooner. “When I was at the weekend bazaars, I noticed that the other vendors were a lot younger than me. It got me thinking, maybe if I had started earlier, my business would be a lot more established now,” she says. But maybe she started at just the right time. She concedes that her law career gave her the financial stability to even consider starting a new venture. “Sometimes, artsy people like me risk everything to pursue their passion. But at the end of the day, we still need to put food on the table. So, whatever we do has to make business sense,” says Lee. Lee was very active at weekend bazaars even though it could be difficult to break even at these venues. A spot at these bazaars, held at shopping malls in the Klang Valley, costs RM200 to RM300 per day (13 hours). It costs at least another RM100 to hire someone to man the booth. “It is very different from what I am used to, as lawyers usually charge thousands for their legal opinion. At the bazaars, people buy RM10 cards from me and I thank them. It is very humbling, but I love it. I get to ditch my court shoes, jacket and suitcase and replace them with a shirt and jeans. I get to work from home and make my children my number one priority,” she says. The average price of an Emma5 card is RM11.90, which is in the mid-range category compared with brands such as Hallmark and Memory Lane. Lee plans to expand her business to Johor Baru and Singapore in the next two years. She says so far everything is going according to plan, although her biggest challenge in running the business is facing rejection. “It was not easy getting the nod from retailers, and I had been rejected so many times. They still believe in big brands. Small businesses such as mine are always in the shadows, so we have to be strong,” says Lee. It was certainly not easy for her to build the business from scratch. She had to learn to build and expand her business, make connections with people in the industry and translate her art into print, which was the hardest of all. “As a lawyer, churning out documents quickly was my daily task. But as a designer, I had to spend time thinking of new designs and paying attention to the details,” says Lee. After coming up with an idea for a card and outlining a rough design, she converts the drawing into vector points to touch up and send to a local printing company. When a card is printed, she reviews the outcome to see if further changes need to be made. If she is satisfied with the final product, the card can be sold at the retailers’ outlets. With her tagline “clean, honest and fun”, Lee makes sure that her designs are positive, and not generic or monotonous, to better compete with the other brands in the market. Some of her designs include phrases such as “Home is wherever I am with you that has WiFi”, “I remembered your birthday without Facebook” and “Happy birthday to you, may you always get great parking spots, cheap flights and free upgrades”. “We do not have these kinds of cards here and looking at the greeting cards in western countries, I noticed that the humorous ones always have vulgar words. I want to make it a point that you do not have be rude to be funny and people of all ages can relate to the message. In my designs, I want to deliver honest expressions from the heart, but I don’t want people to take them too seriously. Also, I don’t want to have to shield them from my children’s eyes,” she says. Emma5 card stands come with 56 pockets, with a different design in each pocket. Up to 30 cards can be placed into each pocket, so there are about 600 cards on the stand at any given time. “Every time I refill the cards, which is every other month, I know which ones are selling and which are not. Normally, the cards that sell well are the love and birthday-themed cards. Although I reprint those that sell well, I try not to reprint too many because I do not want them to seem like they were mass-produced,” says Lee.